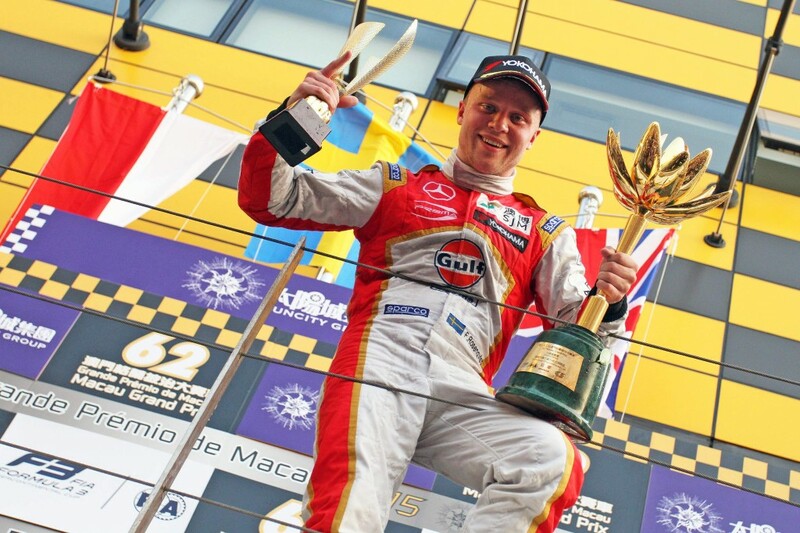 Felix Rosenqvist stormed to victory in the 2015 Macau Grand Prix on Sunday, claiming a second consecutive win in the prestigious Formula 3 street race. The triumph, which comes 12 months after the Swede took honours in the 2014 edition, makes Rosenqvist only the second driver in history (alongside Italian DTM racer Edoardo Mortara) to have won the Chinese blue-riband event two times. Swede Rosenqvist was fastest in both of the qualifying sessions that preceded Sunday’s finale, and also controlled records in Saturday’s Qualification Race on the barrier-lined and ultra-demanding Guia Circuit. He then fought off the advances of Monaco’s Charles Leclerc in the main race, steering his SJM Theodore Racing by Prema Powerteam car to victory. The Macau Grand Prix is widely regarded as the world’s most challenging and prominent junior single-seater race. 13 of the drivers on the current Formula 1 grid have participated in Macau at various points of their careers; none of them have claimed victory. Alongside his Macau Grand Prix victory, Felix Rosenqvist’s 2015 achievements also include winning the FIA Formula 3 European Championship title.